A teenager suspected of being part of a group that threatened three people with a knife is being sought by police. Morgan Helsby, 18, from Birmingham, did not turn up for trial after being charged with three counts of attempted robbery. Two other teenagers have been sent to a young offenders institution after admitting the same charges. The robbery spree began on a train heading from Birmingham to Redditch in March 2015. 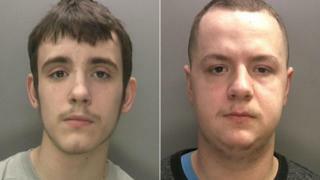 The two sentenced teenagers, both from Birmingham, were 16 years old when they carried out the offences. Kieran Jones, now 19, of Hunton Hill and Reece Timby, 18, of Druids Lane, surrounded a 20-year-old man and threatened him, demanding he give up his phone, British Transport Police said. The victim refused and the teenagers then left the train and proceeded to threaten two men outside a nearby supermarket. Jones held a knife against the stomach of one of the men and ordered them to hand over their watches and phones, police said. They both refused and one of the men was punched in the face. Earlier this month, Jones and Timby were sentenced to four and three years respectively in a young offenders institution. Morgan Helsby of Arthur Street did not appear for trial and police think he could be in the Weston-Super-Mare area.